Spanish guitarist and graphic artist Ángel Ontalva is the mind behind RIO/Avant band October Equus and a slew of other eclectic projects. He is also the founder of the independent label OctoberXart Records, on which his main band’s latest album, Permafrost, was released in the late spring of 2013. A few months before Permafrost, Ontalva released his first solo album, Mundo Flotante, which includes material originated around 2007, and recorded between 2009 and 2012. Two other members of October Equus – bassist Amanda Pazos Cosse, who is also the artist’s wife, and keyboardist Victor Rodriguez – appear on the album, as well as other musicians who had already previously collaborated with Ontalva. Those who approach this album expecting something along the lines of October Equus’ austerely refined take on Avant-Prog may be disappointed, because Mundo Flotante is quite a different animal. Though featuring the same accomplished musicianship and compositional skill, there is very little to remind the listener of Univers Zéro or Henry Cow, while comparisons with the Canterbury scene will often crop up. Indeed, the album’s very title of “Floating World” neatly sums up the airy, effortlessly fluid nature of the music, reminiscent of the quirky elegance of Hatfield and the North or National Health. A rich instrumental texture unfolds a subtly shifting backdrop for Ontalva’s beautiful guitar excursions, suffused with the warmth of the Mediterranean and Middle Eastern tradition. In fact, the album’s roots lie in one of Ontalva’s many projects, called Transarabian Connection, whose sound blended classic jazz-rock and chamber music with the traditional music of Spain’s Sephardic Jews. The overall effect is of refined elegance and high listenability in spite of the obvious complexity of the pieces. The music possesses an upbeat, almost catchy feel – obviously not in a mainstream sense, but still making listening a pleasurable experience even for those who are used to more straightforward, melodic fare. 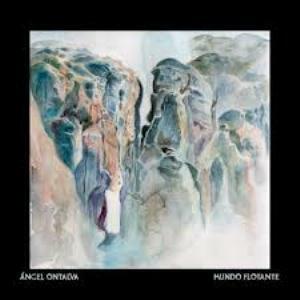 Five of the 12 tracks listed on Mundo Flotante are grouped in a suite titled “Sendas de Ofir”, the album’s centerpiece also on account of it strategic placement in the middle of things. Bookended by gentle, subtly melancholy melodies woven by electric and acoustic guitar, saxophone and keyboards, its central section alternates rarefied passages with an almost improvisational feel and more buoyant ones, led by energetic drums and sax and introducing a hint of dissonance. The elegant flow of the music, its many changes handled with a skilled touch, make for riveting listening, without none of the pretentiousness often associated with ambitious, multi-part compositions. The remaining tracks are even more intriguing, some of their titles hinting at the presence of heady Middle Eastern suggestions. In particular“Leilya”, the only piece featuring Salib’s haunting wordless vocals well complemented by flute, sax, piano and guitar, conjures a North African market place, as well as the timeless magic of flamenco; opener “Sopla el viento del Este”, on the other hand, marries ethnic flavour and a jaunty, appealingly loose jazzy pace, which spotlights Ontalva’s guitar alongside organ and sax. The charming “Bounkam Reverie” evokes the Canterbury sound with its smooth yet intricate interplay between guitar, keyboards and drums (especially in evidence here), while in “Una para Lars” the cello adds its sober voice to the beautiful, romantic tapestry of acoustic guitar arpeggios embellished by tinkling percussion. The wistful “Aurelia quiere saber” pursues the almost autumnal mood of the last part of the suite, with melodica adding an appealing folksy touch. In contrast, the two final tracks on the album – “Sunda Stream” and “Aguas del Bagradas”- reprise the brisk, jazzy tone of the opener, with some sharper, angular moments that hint at Ontalva’s work with October Equus. Clocking in at a mere 43 minutes, Mundo Flotante is full of beautiful, laid-back music that is never in danger of overstaying its welcome, and where Ontalva’s remarkable compositional skill is not overshadowed by excessive ambition (as is often the case with solo albums). The strong ethnic component will especially appeal to those who love some exotic spice in their music of choice, but the album can be safely recommended to most lovers of progressive rock, especially those who lean towards the instrumental side of the genre.